HOW ADORABLE IS HE?!?!?! I literally could not stop playing with him for at least an hour, posing him around the house to find a perfect spot for him to perch before finally deciding to put him in our pie dish (next to my bagels to take to work for lunch) so that he can watch as we cook. I don’t know what I love more about him, his little hat and slippers, or the fact he’s clutching a wooden spoon. Either way, he was a fantastic gift! 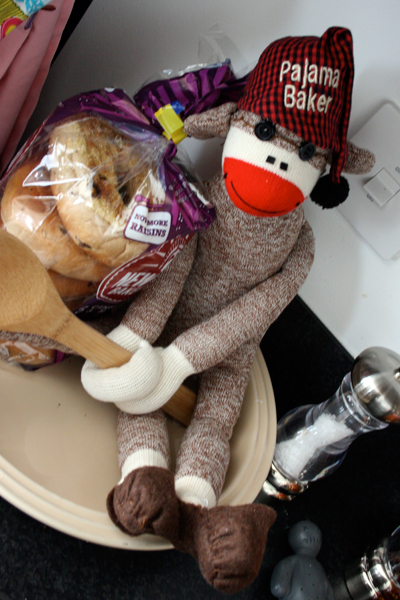 In honor of our newest houseguest, I decided to make an old family favorite: monkey bread. Except when I was looking for a recipe, I came across one from The Pioneer Woman, who I swear has some of the best recipes for everything. Given that I’ve used a lot of her recipes for dinners, I knew I couldn’t go wrong with her twist on sharing favorite: orange and vanilla. 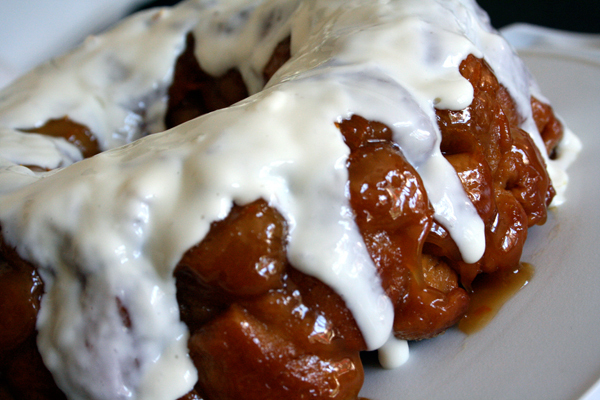 I added my own little touch by making a quick cream cheese glaze to to drizzle over the top. Normally you make monkey bread with pre-packaged biscuit dough, but you can’t get that here in the UK; so I made up a quick basic dough to chop up and use instead and it was just as tasty. This bread is great for a brunch, as you can put it in the center of the table and let everyone pick away at all the little bits. Just be sure to have plenty of napkins on hand for sticky fingers! 1. Preheat oven to 350° F (approx 175°C). 2. First, chop up all of your biscuit dough into small, bite-sized pieces. In a large zip-top bag, mix the sugar, salt, and orange zest; once they’re all mixed together, add in your biscuit dough pieces, seal it up, and give it a good shake to coat everything. Dump all of the biscuit pieces into a bundt pan and set aside. 3. In a pan over medium heat, melt the butter. Stir in the brown sugar and vanilla, stirring until they’re all combined. Don’t let the sugar mixture start to boil though! Once they’re mixed, pour the goo on top of all your biscuit pieces in the pan. Give the pan a bit of a shake to help everything settle. 4. 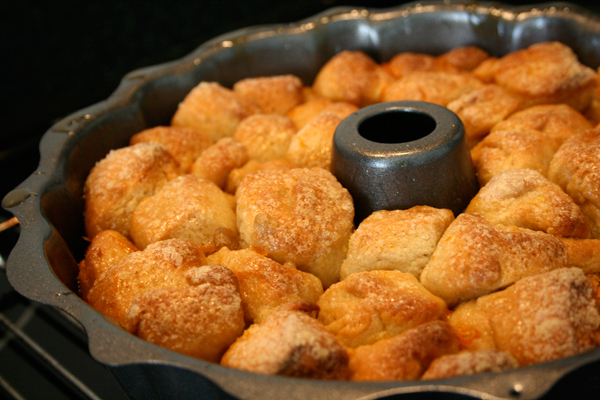 Place the pan in the oven and bake for about 25 minutes, until the tops of the biscuits start to turn a golden brown. Remove from the oven and allow to cool in the pan for 10 minutes. Do not let it rest any longer or it’ll stick in the pan! After the 10 minutes, turn it out onto your serving plate. 5. While the bread is baking, beat the cream cheese in your mixer on a medium-high speed until it becomes super creamy. Gradually add in your icing sugar, and dilute with a bit of milk until you get a sort of runny consistency. Basically, you want it to be able to drip it onto the top of the cake and only drizzle down the sides a bit – so you shouldn’t need to add too much milk. Remember, your hot bread will cause it to melt and become even runnier! 6. After turning the bread out of your bundt pan, let it sit for about 5 minutes before drizzling on the cream cheese glaze. Love the story and cute sock monkey! Stacey G.